One of the reasons we wanted to go off on an international adventure was to downshift our lifestyle a bit. Living in Gilbert, AZ made it easy to drive less than a mile to buy whatever item you could possible want – whether you needed it or not. Add to that Amazon Prime (we had TWO accounts for one household) and you get a bit of spending frenzy that becomes habit. We also lived in an area where it was easy to think you needed more: bigger pool, nicer car, prettier clothes to wear to the nicer gym. I’m not saying that Gilbert is a bad place – we love it and we’ll go back there someday – but it’s just easy to get caught up on all those “shoulds” that, when you really step back, are not part of what makes one truly happy. So one downshift we really wanted to do was with holidays and gifts. 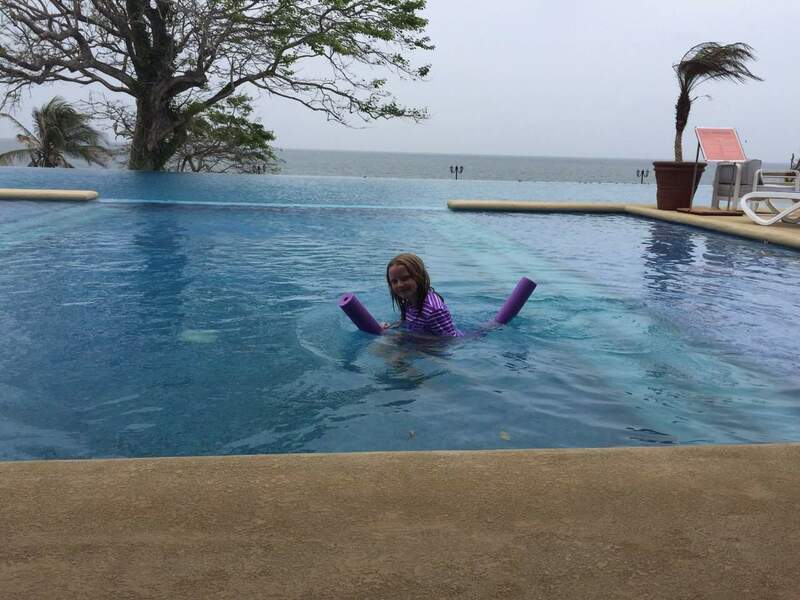 We tended to do blow-out holidays and birthdays, but moving to Panama was a good excuse to pull back and make it a little more calm. Christmas this year was still a bit of an affair but substantially less than usual. There were baskets at Easter but pretty minimal and mostly filled with sugary treats that we received from the USA. For Zoe’s birthday we downshifted even more. 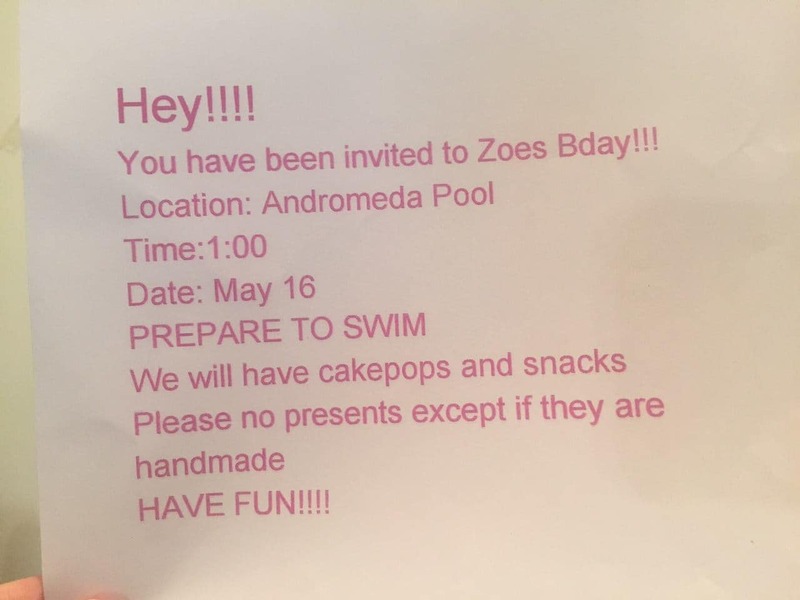 Whereas usually I would print really nice invitations on special paper, it would be a multi-step process probably involving glitter, stickers or even Costco Photo, this time Zoe wrote out her own invitations in Word, printed it on our cranky printer and delivered it to the 6 friends that were invited. It’s possible some people didn’t even see the written invitation and only came based on my text. I might not have even used an emoji. We also told Zoe that we would not accept gifts from friends on this birthday. Family and close friends from the states had mailed a few things and donated to Zoe’s spending money for an upcoming trip to Orlando. Daniel and I also purchased a few nice things for her, but we told friends that they were not to bring any gifts to the party unless they were handmade. I’m so pleased that everyone respected the instructions. The handmade gifts that the kids brought were some of the sweetest things Zoe has received. Flowers, homemade chocolate chip cookies, rainbow loom bracelet and ring, homemade cards and a really sweet photo collage were all amazing to see. I think Zoe really enjoyed that the gifts were clearly from her friends, not from the parents who were sent to the toy store the day before the party. The party itself was very low key but a LOT of fun. There were no balloons, no themed plates or table coverings, no pre-ordered cake and not a single streamer. There was a big pool, some pool toys, some nutella and peanut butter sandwiches and homemade cake pops. 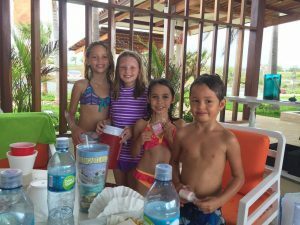 And the pool manager was nice enough to put on an incredible scavenger hunt for the kids, completely unexpected by us. 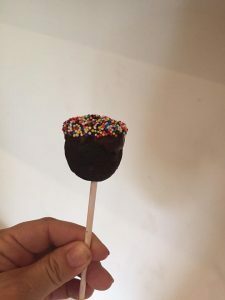 The most effort I put into the party was making cake pops for the first time. 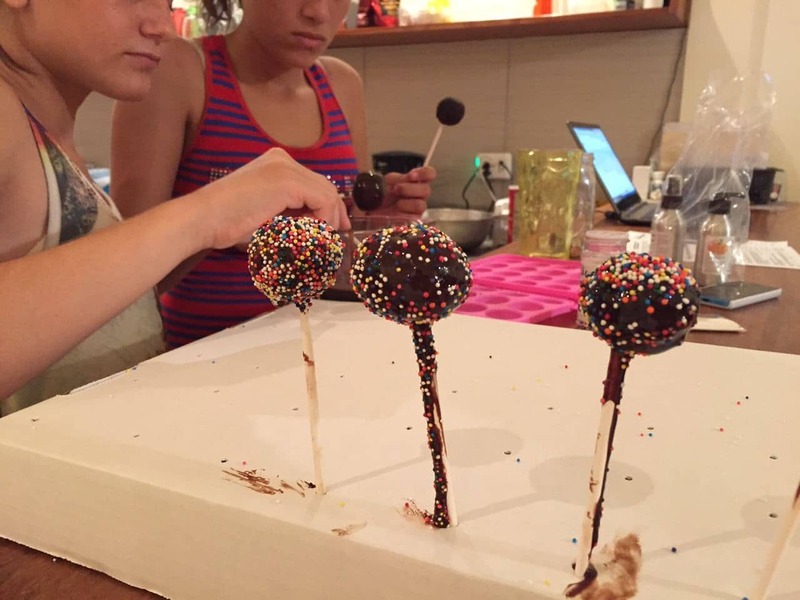 They didn’t turn out so well until Lucy came over and fixed the frosting for me. The $5 I paid Lucy for her help and the $40 we paid for pop and water and a few more snacks at the pool was the biggest expense of the party. After the 4 hour party we came home to get cleaned up and were invited to a friend’s house for a barbeque. Zoe and Haley chose to stay home and play the Wii. Haley playing the Wii with Zoe is a lovely gift in and of itself! They had pizza and stayed home alone playing Wii in their pajamas. Daniel and I enjoyed the ever-delicious spread of food at Ted’s but still came home in time to watch a movie of Zoe’s choice. 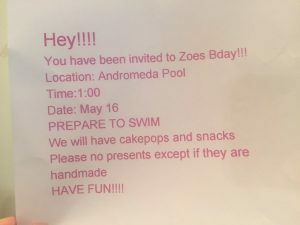 A low-key pool party, minimal gifts, playing the Wii and family movie night translated into a wonderful birthday for both Zoe and her party planning mother. And we only had to move to Panama to do it! Cake pops, new and improved after Lucy.